If you like to travel, and often go on business or leave for vacation, you are aware of all the problems a woman face when she is trying to look her best on the road or far away from home. If you decide to take along all your cosmetics, it is likely that there will no longer be any place for other stuff. Let alone the hair straightener. You may go to the beach to swim or sunbathe in the morning with no regard for what your hair looks like, but in the evening you want to look attractive because you are going to have a date in a restaurant. What`s to be done? We all know that most straighteners are bulky and heavy. There is a solution! Take a look at our list of 5 portable cordless flat irons and choose the one you need. One of the best solutions for travels which I found on the market of cordless devices is this tiny flat iron by Deogratias. It is lightweight and is not larger than a cell phone. 7,8 inches of perfection good for your hair and suitable for traveling, what more to wish from a cordless hair straightener? Put it in luggage, a purse or even a cosmetic bag – the device won’t take much place there and will help you change hairstyles on the go. The model is equipped with ceramic tourmaline plates with negative ions to eliminate static, reduce frizz, and protect hair from damage during styling. 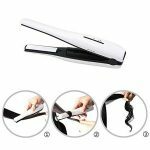 Deogratias flat iron heats up to 410℉ in dozens of seconds to offer you fast styling for straightening, flipping, and curling your hair. Shiny and silky look whatever style you choose, isn’t it the thing you crave so much? Recharging this cordless device is easy as ABC: the USB charging cable comes at your disposal and makes re-charging possible in any location in the world. This powerful, cordless, compact tool will help you create a salon quality hairstyle no matter where you are. Its titanium plates will not harm your hair, preserving its elasticity and softness. This device is small and lightweight, which is great for easy transportation. The titanium flat iron preserves moisture in the structure of each hair, making your locks look healthy and shiny. Its lithium battery gives from 30 minutes to 1 hour of continuous heating, depending on the settings you choose. You can recharge this styling device even in the car. The iron has a lock mechanism for more safety, and its special case provides protection of the tool during the trip. 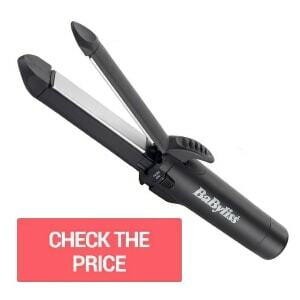 First of all, the Babyliss-2581bu gas hair straightener is designed to be small enough to fit in a small travel bag. It is a perfect tool for a journey or a picnic. The iron is fueled by a gas cartridge. So, you can take it anywhere you go and be sure your hair will be straight and styled whenever you need. It features ceramic floating plates that provide even pressure, thus making your hair look perfectly smooth. 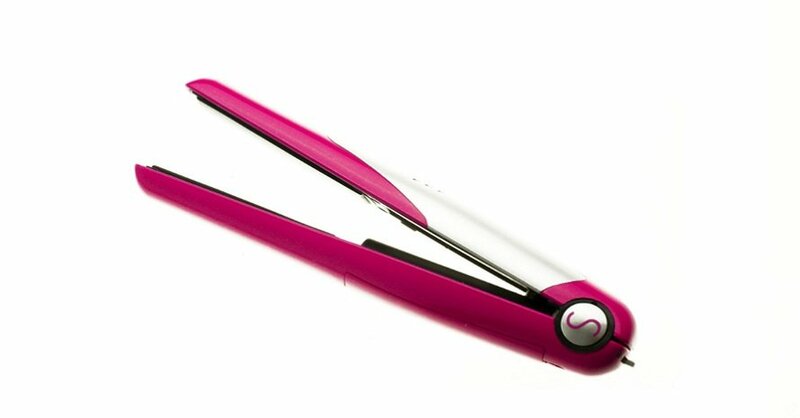 The portable flat iron can reach temperatures of up to 215°C. By the way, it heats up very quickly thanks to butane, which gives off natural warmth. Keep the plates of the flat iron closed together when heating them up. If you keep them open, only one plate will heat up. Its innovative Keratin Protech plates will give your hair healthy appearance and shine and protect it from heat damage. The device features three temperature modes: 140°C, 160°C and 180°C for gentle styling. Its compact size will allow you to carry the tool in a handbag or a clutch. 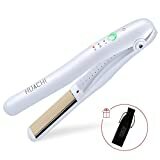 Thanks to its rechargeable lithium battery, the flat iron may be continuously used for about 25 minutes from one full charge. Its heatproof travel pouch means that you can put the tool into your bag while it is still warm. unique Keratin Protech technology, which minimizes hair damage by 50 percent. 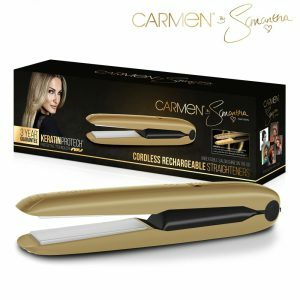 The Carmen by Samantha cordless rechargeable hair straightener is a wonderful choice if you are far away from your dressing table but still want your hair to look well-groomed because you are a real lady! 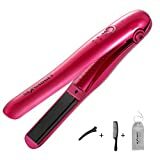 This cordless mini straightener is a budget option for those girls who are going on a trip but do not want to spend a lot of money on a portable styler. 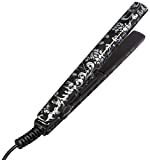 This mini flat iron features two adjustable temperature modes. You can choose the one that suits your hair type and condition. The device is ideal for traveling. Moreover, this handy accessory is great for touch-ups. If you are going to the party or having a date, this amazing tool will help you look gorgeous from beginning till end. Its ceramic coated plates contribute to even heat distribution and salon quality results. Its charging time is 3 hours and its operation time is 30-50 minutes before recharge. it has solid ceramic plates. I hope the information provided above will be useful for you and your vacation or business trip will be a success. An important advantage of cordless hair straighteners is that they are indispensable helpers on the road. You can make your hairstyle look well-groomed at any time and in any situation. You can also use a cordless hair straightener at home. 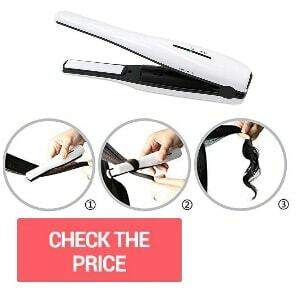 It is very convenient because the annoying cord will not get in the way while you`re styling your locks. I am too going camping where there is no electricity. Will these straighteners remain charged for 3 days if I charge them at home first.? Are they mains or battery powered? It depends on how much time you need to straighten your hair. For example, DEOGRA straightener is designed for up to 90 minutes of continuous operation without recharging. It means you can use the device for 4-5 days if your hairstyling process takes up to 20 minutes. DEOGRA has high-quality Korean SAMSUNG batteries with a short charging time (only 2 hours). 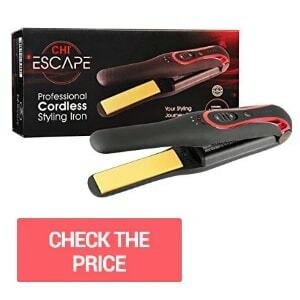 CHI Escape Battery Powered Hair Straightener has a lithium battery that gives from 30 minutes to 1 hour of continuous heating, depending on the settings you choose. 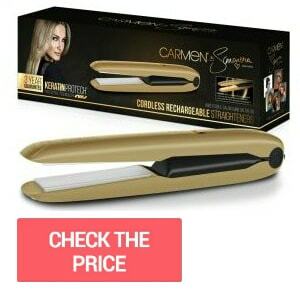 Carmen Wireless Hair Straightener has a rechargeable lithium battery, the flat iron may be continuously used for about 25 minutes from one full charge. this blog. I’m hoping to view the same high-grade content by you in the future as well. Thank you! This is my pleasure! I am going to Europe and I have normal/fine hair. I am wanting to just get a cordless straightner as I am packing lightly. Which do you suggest gets the hottest and has the best charge/use time? I appreciate any input! I recommend you to take flat iron by Deogratias with you. Its USB charging cable makes re-charging possible in any location in the world. The iron is lightweight for traveling and can be used for about 30 minutes, allowing you to change your hairstyle at any time, anywhere. for me. I am looking forward on your subsequent publish, I’ll attempt to get the hold of it! I use this one myself, esp when I travel to Europe, so didn’t have to worry about the different plugs and voltage. Hi, Which travel straightener would you recommend for someone with very thick curly/wavy hair? Hello, Florence! Thank you for your question. In my guide on best travel size hair products I’ve wrote about BaBylissPRO Nano Titanium Mini Straightening Iron. It fits for thick hair. My other recommendation will be Cordless Mini Travel Flat Iron by DEOGRATIAS. Its price a bit higher, but I use this one personally. It’s very convenient!